Imaginations will run wild with all the creative ways to use the oil and vinegar in this box. The olives add a perfect snack. 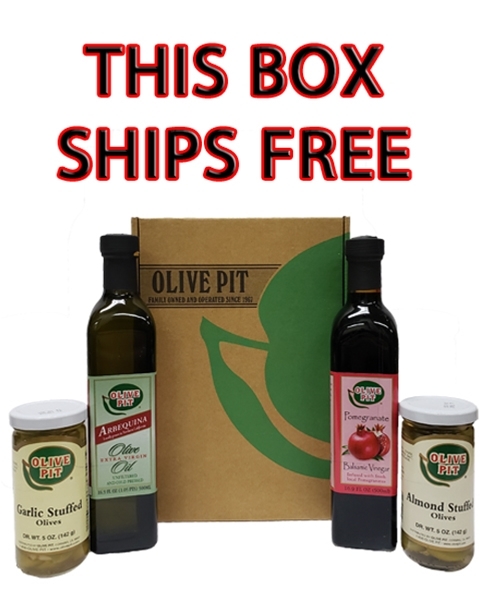 Includes: Almond Stuffed Olives 1/2 Pint, Garlic Stuffed Olives 1/2 Pint, Locally produced Extra Virgin Olive Oil 16.9z & Pomegranate Traditional Balsamic Vinegar 16.9z. * Jalapeno Stuffed Olives may be used as an alternative.